This is one of my favorite films: I love it unconditionally and without reservation and, needless to say, without a shred of objectivity. I will never forget the joy with which I first watched it, a joy that has never diminished, and the love it gave me for Shammi (also undiminished). Shammi Shammi Shammi! I had seen him in a few other films and liked him okay; but this—this sent me tumbling head over heels, never to recover. 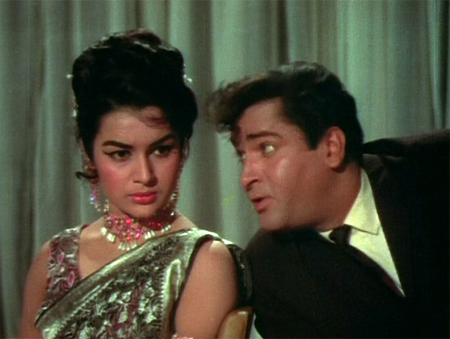 His charm and chemistry with Asha Parekh stunned me (and so did she). This is also the first Vijay Anand film I saw, and of course I’ve gone on to love a lot more of his work, too. And can I say any more at this point about my Helen worship? I think not.